The headline story of Labour’s disastrous UK election result last week is that people still didn’t trust the party’s competence, despite its best efforts to show that its manifesto was fiscally responsible. Former Labour big hitters have been swift to say what they think. In January Tony Blair (Labour’s leader 1994-2007) predicted a general election ‘in which a traditional left-wing party competes with a traditional right-wing party, with the traditional result.’ (A big loss, in other words). Right after the election, Blair advised Labour to stand for ‘ambition and aspiration as well as compassion and care’. Alan Sugar resigned from the party because he believes it has become anti-business. David Miliband thinks Labour will not win until it can ‘embrace a politics of aspiration and inclusion.’ It wasn’t that the public didn’t get Labour’s proposition last week. They just didn’t like it, he says. Indignant supporters say that Blair and others are just bitter they weren’t consulted. And they argue that Labour’s manifesto was pragmatic about all sorts of things like welfare reform and prospective cuts. But there is a consensus among seasoned observers of Labour that it made a giant strategic error. By championing the disenfranchised, it let the electorate think it wanted the country to regress to an older, more militant version of itself. 1. Labour made itself distinctive by identifying with those who were angriest about austerity. Its recurring phrase ‘working people’ was deliberately vague, but also code for (oppressed) working class. 2. 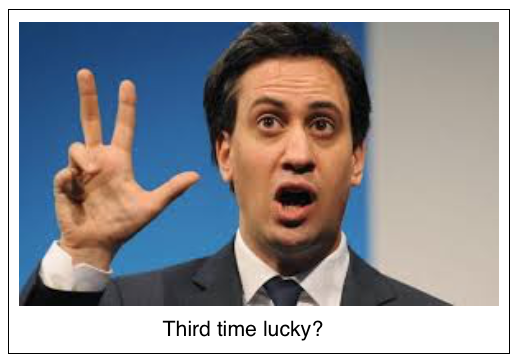 The party’s now ex-leader, Ed Miliband, is heavily influenced by Critical theory, eg Marx, Gramsci. 3. So he has strong views about emancipating the disenfranchised and the powerless. 4. Emancipation requires a bad guy. 5. Why? The bad guy is more like an ‘antagonistic force’ that must be tamed, or the disenfranchised will never know fulfilment (Laclau & Mouffe 1985). 6. So Labour’s leaders felt that their credibility required them to declare their opposition to the bad guy. Hence the return to 50% as the top rate of income tax, a new label for property worth over £2m (‘mansion’), antipathy to non-doms and employers who grant zero-hour contracts. 7. Redistributing wealth has practical benefits. It also satisfies a deep ideological need to pick a side. 8. You can’t pick one side unless there’s a side you don’t pick. 9. The side you don’t pick defines you just as much as the one you do. 10. Labour saw stark polarities and planned remedial action. In the 2015 general election not enough voters saw things so simply, at least in England. There’s an Epstein statue outside the TUC (Trades Union Congress) building in London. It shows a hero figure rescuing someone who has been knocked to the ground. It would have made a fitting symbol of Labour’s election strategy. It began life as a war memorial, but was later repurposed and given the title The Spirit of Tradesunionism. Though a little soiled by London air, it’s still splendid. But the sculpture does not tell the full story. The ‘spirit of tradesunionism’ requires a hero – the TUC. And what does the hero need? A villain, otherwise there is no victim. No victim, no hero. What is absent is any insight into the villain, who isn’t even featured. 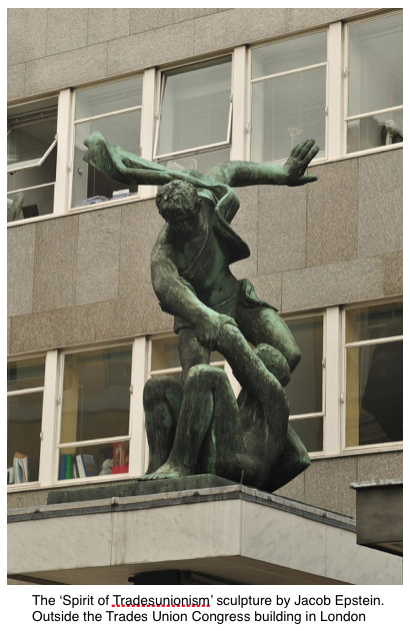 The statue implies that the victim was thrown to the ground by the villain, and it seems that is all we need to know. The interdependence going on here makes for a harder story to tell, but a more truthful one too. Because the other truth about the villain is that he/she creates businesses and jobs. This is not to forget that unions can do important work. The TUC exists to expose shoddy practice and hold managers to account, which is a good thing. But casting the manager as a villain makes antagonism inevitable. Antagonism ensures a role for the union, but is not usually conducive to good collaboration. In February an elegant article by Matthew Taylor of the RSA (Royal Society of Arts) feared the election would fail to produce a nuanced debate about business and its responsibilities. He placed much of the blame on media with an unhealthy appetite for simple headlines. So the media helped to ensure that Labour told the hero/victim/bad guy story. But Labour had already been seduced by its ideology. The votes cast last week show that, if nuance is dangerous, oversimplifying is more dangerous still. Nearly 50 years ago the great organisational scholar Karl Weick proposed that the right response to complexity was to ‘complicate yourself’. In other words, play with multiple, contradictory truths, and resist the tidy little models that wilfully ignore the mess. 1969! You normally look that far back in organisational writing if you want a good laugh about how far we have come since then. But few ideas about work feel more modern – or as unevenly applied – as ‘complicate yourself’. Some things are harder to learn than others. Will two election defeats be lesson enough for Labour? Previous post: Do brands make life too easy?